Welcome to the Kicks Gallery! 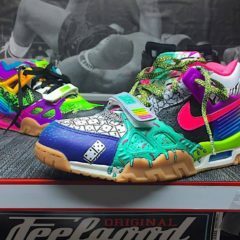 Here you’ll find a variety of customs shoes & the stencils we used to create our customer’s kicks! We use only premium products to complete our custom work and our sponsors Angelus Brand are a huge factor in producing quality work. We have stencils for sale if you would like to try the customs yourself! 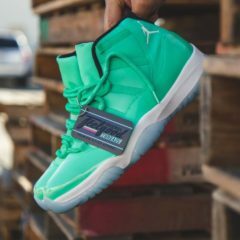 We require brand new shoes to create custom shoe orders. CLICK HERE TO GET THE PAINTS & SUPPLIES! 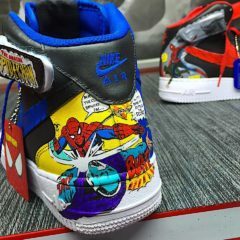 These Spiderman themed Air Force Ones were made with a combination of hand painting and airbrushing. 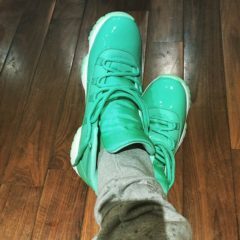 This pair is a 1 of 1 custom and will not be replicated. This custom was actually freestyled (customer gave us full creative control) as a birthday gift for his good friend. These Air Force Ones were created for someone who has a true love for Spiderman. As a comic book fan, one can only imagine to have something created that is near and dear to them, and be the only person to own them. These customs were made way before Nike released their “Top 3” Jordan 1 model. 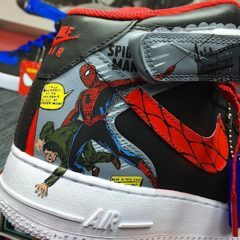 Both images that were painted on the shoes were actual comic clips from Spiderman comics. The right shoe is from a famous cover issue called “Amazing Fantasy” #15 (1962), where Spidey swings through the city grabbing yet another villain. Drop your own Banned logos on your kicks with the help of these simple Banned stencils! 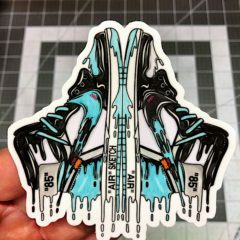 The pair of stencils comes ready to peel and drop on your Jordan's immediately and lays out exactly where you need to map out your stencil! Painting your logo can either be done by hand brush or airbrush! 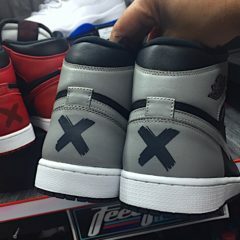 One pair covers the back heel for the Jordan 1 model in the exact size shown in the picture. Stand out from the rest and add your own personal touch! Bape x Supreme Stencil Set – Easy to Use Stencils to Customize Your Kicks! Bape x Supreme Stencil sets are easy to apply stencils that you can place on your shoes or any other surface that you can place the stencil and paint! Below is a description of all you need to know. This stencil set includes 10 Bape Ape vinyl stencils to help complete a professional Bape custom on your kicks. 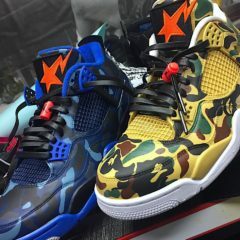 The Bape ape stencils are randomly selected to ensure you have a variety of the Camo images. There are about 3-4 different ape images so you will receive some duplicates. 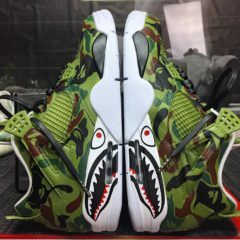 Save time and accurately paint Bape logos on your kicks! To learn how to apply these stencils, check our Youtube tutorial below. 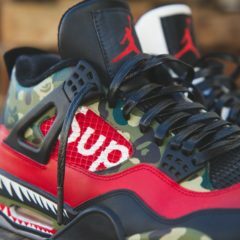 You will receive 4 Supreme “Sup” logos for the netting area of the Jordan 4. These Sup logos have countless possibilities and can be applied in different positions on several other shoes. Get a clean Supreme box logo look and save time with these stencils! In total, this stencil set includes 14 stencils. The stencils are a combination of the above stencil sets and helps you complete several possibilities in customizing your shoes. 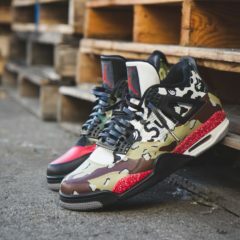 These are the same stencils we used to make the shoes pictured. 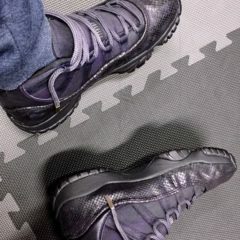 Use them on one pair or split them into 2 or more kicks! 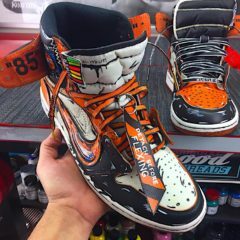 Learn how to customize your kicks with the quality and accuracy of the professionals! To see how to apply stencils, scroll down below and check out our tutorial! 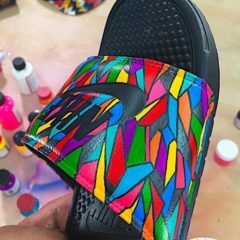 Here's a look at some of the custom summer slides we have created for Angelus Brand and clients as well. All of these styles we were given free reign to create whatever we liked. Prices for slides start at $150 per day and we will gladly provide the base slides for $30. 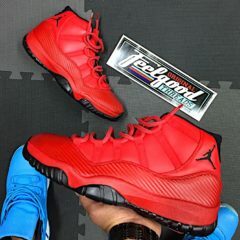 If you are interested in a particular theme, would like to provide creative insight or would like us to freestyle a pair for you (surprise you), please contact us. We will not copy any artists original artwork, out of respect for them, so we hope you understand. If you are unsure if your theme may be too close to another artist’s work, please contact us! No orders will be fulfilled until we communicate pricing, time to complete and other important details. 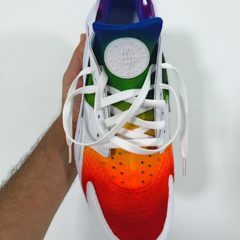 We will be opening up 5 spots for the rainbow custom we did for Angelus Brand on their YouTube channel. 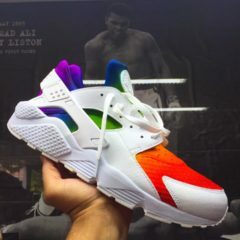 We are only accepting 5 customers for this rainbow Huarache custom. Estimated time of completion will be 2 weeks. 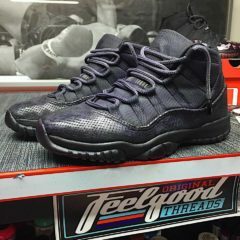 We will start customizing once all orders have been fulfilled and paid. If you are shipping your Huaraches, please contact us first before placing order. We must confirm you purchasing the correct pair and they must be brand new. Contact us at info@shopfeelgood.com for any additional questions. 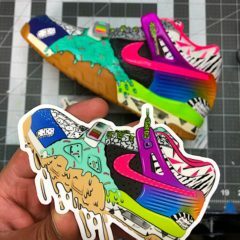 Feelgood Threads custom stickers are high quality stickers replicating actual custom shoes that we completed! Easy peel and stick kicks to display wherever you need to add some drip, literally. Drop them on your laptop, workspace or wall, these die cut stickers are guaranteed to add some color! Stickers measure approximately 4” x 4” and have a high gloss finish. More selections coming soon! 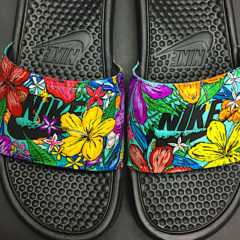 GIVEAWAY: Hawaiian Slides Custom Giveaway & Angelus Gift Bag! THE FEELGOOD END OF YEAR GIVEAWAY! 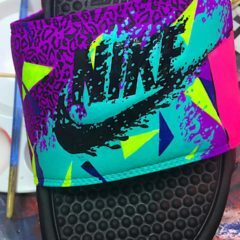 THESE ARE FOR A SIZE 8 CUSTOMIZED PAIR OF NIKE SLIDES! The Guccissima Stencil Pack is an easy to apply stencil that you can place on your shoes or any other surface that you can place the stencil and paint! 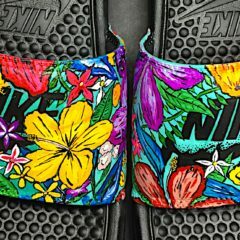 Each panel will usually cover the outside of the shoes and possibly the inside, depending on size and coverage area. We recommend purchasing 2 pages to fill a pair of shoes completely, but this is only an estimate. Guccissima print is approximately .4 inches in height and .55 inches in height. If you're reading this, we're just trying to make birthdays great again. 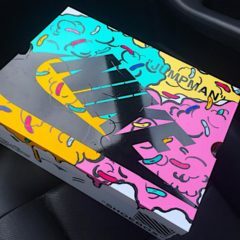 Now that you found the box, lets talk about it and whats inside of it. Our buddy Nelson's birthday is coming up, and he asked for a custom request. Since it was for his birthday, we found it fitting to ice out his box with ice cream and sprinkles to celebrate! This box took 4 days to create. 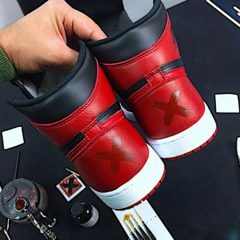 First we deconstructed the Jordan 1 to simulate the Off White Chicago 1s. Once the shoes were broken down, we moved on to painting the shoes. We took one shoe and color blocked it to look like the Shattered Backboard 1. We added the Off White Stencil pack (available here: Off White Stencil Pack ) to blend a Shattered Backboard and an Off White custom. 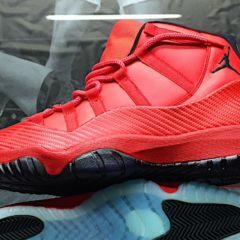 Now that 1 shoe was complete, we had to finish the other. Like the recent Top 3 series, we decided to switch up the toebox color and give the right shoe a completely different, but matching type of vibe. 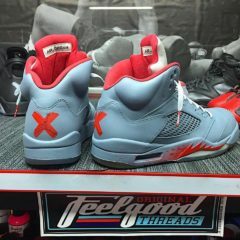 This side also used the Off White stencil pack, but we changed the colorway and laces to look like a completely different shoe. We loved the cream toe so we left the buttery leather as is and simply added some details. The objective was to make 2 shoes look so independent of one another, but blend so well next to one another. Once the colorways were solidified, we began to define both shoes by detailing them out. Nelson wanted a cartoon sketch style look as we did on the last pair of shoes, so sketch is what he got. 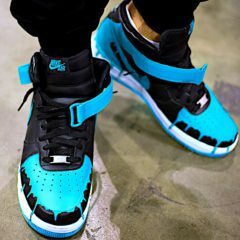 Exaggerated swooshes embellish the outside uppers and are tapered off with a lightning bolt look. This is where we take the initiative to come up with something truly special for our clients. Most customizers would be content with the work they have put in at this point. 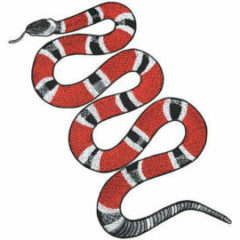 But our client deserves something that he can not only wear, but sentimentally be fond of. Something he can appreciate. 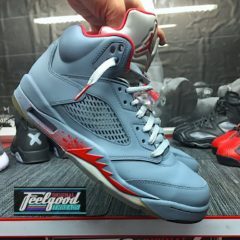 This is where smaller details like custom tongue tags, “Detach Before Flexing” hangtag, and custom NOS buttons really count. 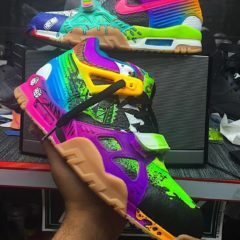 Do you remember the first time you were really amped when you got a pair of shoes you really wanted? Think about it, truly give it some thought. How old were you? Where were you and what was the pair of shoes? Mine were the Karl Malone L.A. Gear Catapults. That's the feeling that we aim to fulfill. Hope we hit the mark for you Nelson and Happy Birthday brother. “Make Birthdays Great Again”.